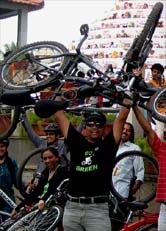 Go Green Campaign Ride 20 Dec 2009 - GGI-Group size: 4000+ Professionals, Increasing on day to day basis, Come & join us 2 serve Mother Nature. 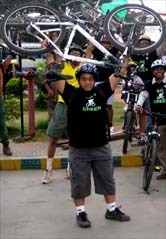 Started off by 6:55am.. We were totally 15 members who did participated, Kiran Garadi from Mathikera & Shaleen from HSR layout were 2 new GGI's joined for this ride. 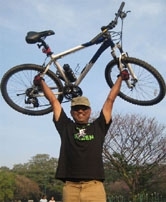 Following is the route followed..
Malya Hospital, hotel Ramanashree - Residencey Rd flyover - doubel road -Lalbagh Main gate - Lalbagh rear Gate - Ashoka Pillar - Swiming Pool road - Jaynagar 4th block - KFC - Jaynagar 5th Blk Cofee day/ Apple Mac show room. Few more snaps from the ride.